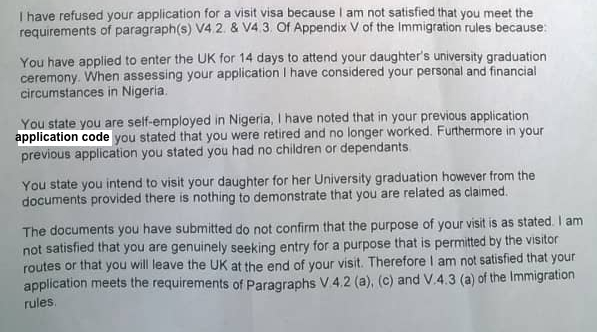 My mother was denied a visa to attend my graduation and she has been crying since she received this heartbreaking news. I really want her to attend my graduation. How do I remedy this problem? After working for an organisation, she started her own business and she attached a document showing her business registration and business account details. The last application she did was done by an agent as she was feeling poorly during that period. So the agent mentioned that she has no relative or dependent. Your mother has got herself into something of a pickle. UK immigration appear to have declarations from her saying she is retired, and that she has no offspring. Now, she's applying for a visa with both those declarations apparently in error. This casts serious doubt on her credibility, and overcoming that doubt will be an uphill struggle. Not only does she now have to document exactly her current situation, but she must also explain how those errors came about. This will not be easily fixed, if it can be fixed at all. She needs the advice of a lawyer with expertise in UK immigration - strangers on the internet will not be enough. Expect this to be expensive. Not the answer you're looking for? Browse other questions tagged visa-refusals uk-residents nigeria or ask your own question.